Kigo Video Converter Pro for Mac OS X supports all popular video formats including AVI, DivX, XviD, MPEG-1, MPEG-2, WMV, ASF, MOV, VOB, MP4, 3GP, 3G2 or QuickTime into iPod, PSP, Zune, MP4, 3GP, 3G2, AVI, MPEG-1, MPEG-2, WMV, DivX, XviD, ASF, MOV, VOB video files. This video Converter supports iPod, iPhone, PSP, Zune and other Portable Media Players and cell phones. 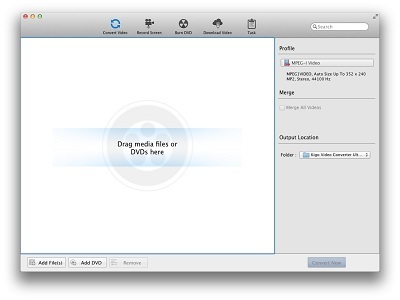 DVD Creator is easy and fast to help you burn any SD/HD videos into DVD disc or DVD Folder. You can also customize DVD with free yet gorgeous DVD menu as you like. Besides, It is convenient with the all-in-one program to edit videos such as crop, add effect and watermark, etc before burn. VideoPad Masters Edition - VideoPad Masters Edition for Windows allows you to create and edit videos from many different formats. Create great looking videos or movies quickly with the intuitive user interface. Drag and drop video clips and easily add effects. Atlas Subtitler - Atlas Subtitler makes it very easy to download subtitles in any language for a whole series of videos. It supports Drag&Drop and can shift (sync) subtitles in a part of the film. It can also adjust to unequal speeds and prepare them for a player. CinEx HD Utility - CinEx HD Utility is the perfect AddOn for AnyDVD HD and DVDFab customers. With CinEx HD you can remove Cinavia from original Blu-ray, already copied Blu-ray and ripped or downloaded video files. Total Video Player for Mac - Total Video Player for Mac is the best universal AVI Player for Mac and MKV Player Mac, supporting 4K, 1080p, Mp4, H264, Mov, FLV, MKV and all other popular video files together with any audio formats(Mp3, Wma, Ogg...)as well as DVDs and CD Audios. VideoPad Video Editor Free for Mac - VideoPad Free Video Editing Program is designed to be intuitive. VideoPad Free for Mac is a fully featured video file editor for creating professional quality videos in minutes. With VideoPad Free Video Editor, making videos has never been more fun! Soft4Boost Split Movie - Edit MPEG, AVI, DVD, Blu-ray, HD, WMV, etc. easily and quickly! Cut, trim, remove unwanted video parts and save your video anew. Create your own DVD/Blu-ray menus. Capture your video from camcorders and video cameras and make screen capturings. Soft4Boost Video Capture - Capture video from DV cams, miniDV camcorders and WEB cameras and video capture devices. Digitize your VHS tapes made with old VHS cams. Transfer video to AVI format or directly to MPEG-2 or MJPEG formats. Leave free space on your computer. M4V Converter Plus for Win - M4V Converter Plus for Win can convert iTunes M4V protected files to unprotected MOV, MP4, AVI and other audio formats with high quality and fast conversion speed. Besides, it can convert the purchased iTunes movies and iTunes movies rental. Soft4Boost TV Recorder - Watch and record TV to PC from any sources like satellite, TV and DVB cards and digital cameras with Soft4Boost TV Recorder. It's a universal software TV viewer with Personal Video Recorder functionality (PVR) allowing you to schedule TV recordings.